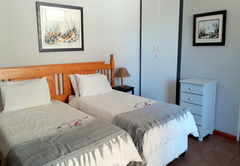 Penny Lane Lodge is a highly recommended property providing self catering in Somerset West for tourists visiting the Cape Helderberg region. 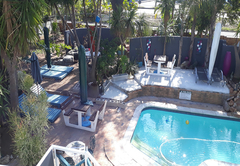 Penny Lane Lodge is ideally situated for the tourist or business person to experience all that the Western Cape and Cape Town has to offer. Our Motto is “everything is here, everything is near”. 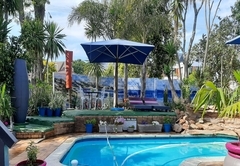 Penny Lane Lodge is situated in the beautiful town of Somerset West, the Gateway to the Cape Winelands and has majestic views of the Helderberg Mountains. We are close to 6 major golf courses including the world famous Erinvale Golf Course. 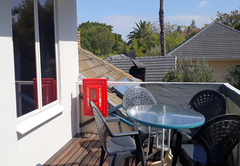 We are 20 minutes from Cape Town International Airport, 35 minutes from Cape Town CBD, 15 minutes away from the historical town of Stellenbosch and close to the lovely beaches of Strand and Gordon’s Bay. 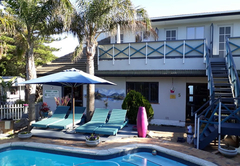 There are numerous experiences in the surrounding area, such as fishing, abseiling, whale watching, bird watching, mountain hiking, nature reserves and all water sports. 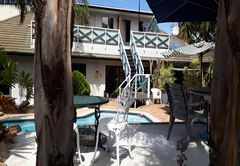 Penny Lane Lodge offers a choice of six self catering units (sleeping 2 to 4 people), all with en-suite bathrooms, TV, tea and coffee trays and bar fridges or normal fridges. All units also have their own entrances and air-conditioning units. 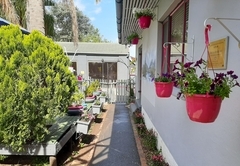 Self catering unit with 2 bedrooms, 2 bathrooms, lounge, kitchen, patio with braai facilities. 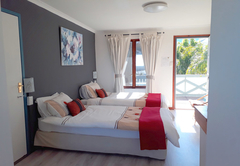 Self catering unit with air-con, 2 bedrooms (1 with twin beds and 1 with queen-size bed), lounge, mini kitchen, 1 bathroom, balcony with beautiful views of the Helderberg Mountains. This is our family unit, suitable for parents with up to 2 children. 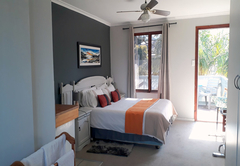 Self catering unit with air-con, twin beds, bathroom (shower), mini kitchen, balcony with beautiful views of the Helderberg Mountains. 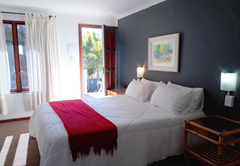 Double room with queen bed, bathroom, aircon and balcony with beautiful views of the Helderberg mountains. This unit is let on a room only basis: fridge, kettle and microwave provided. 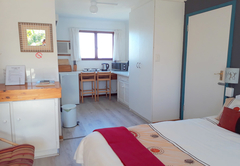 Self catering unit with twin beds, aircon, mini kitchen, bathroom (shower), patio and braai area in the garden. 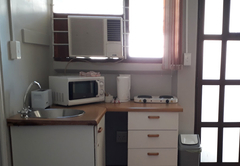 Self Catering unit with queen-size bed, aircon, mini kitchen bathroom (shower), patio and braai area in the garden. 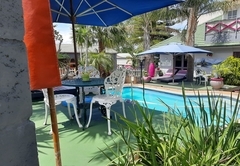 Penny Lane Lodge has a beautiful outdoor swimming pool set in lush gardens with loungers and chairs for guests' use. 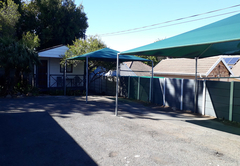 Braai (barbeque) areas are available and there is secure inside parking. All guests are provided with a remote control for the main gate along with their room key. 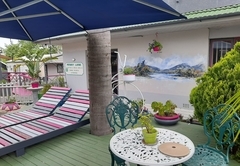 Penny Lane Lodge has its own art gallery where Diane the guest house owner and artist creates and displays her paintings. Her artwork decorates the walls throughout the property and many of her paintings are available for sale - the perfect souvenir of your visit to beautiful South Africa. This is a self catering Chalet with a double bed. TV, air-conditioning, mini kitchen, patio, en-suite bathroom (shower only). 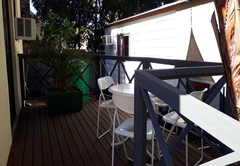 2 bedroom self-catering cottage: lounge, aircon, full kitchen. 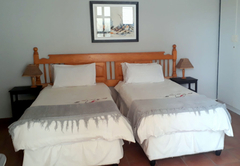 Double bedroom, wc/shower; twin bedroom en-suite bath/shower. 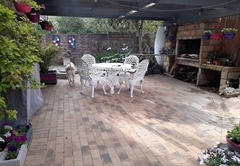 Patio with braai. 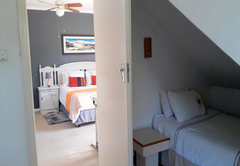 2 room studio: lounge/bedroom and en-suite shower/wc + 2nd bedroom. Mini kitchen, TV, balcony with mountain views. One double bed, two twin beds. 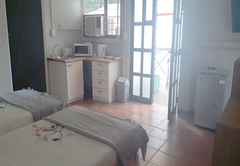 This is a Self-catering studio with twin beds, en-suite shower/wc. TV, a mini kitchen. There is also a balcony with mountain views. Studio with 2 twin beds, en-suite bath/shower and wc. Microwave and kettle; tea/coffee tray, TV. Balcony with mountain views. 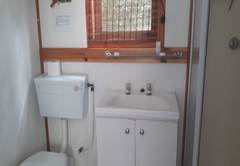 Chalet 2 has a Queen bed, a comfortable sitting area, en -suite shower / wc. Air-con, TV, mini kitchen, patio and a braai area. Response timePenny Lane Lodge typically responds to requests in 5-10 minutes.